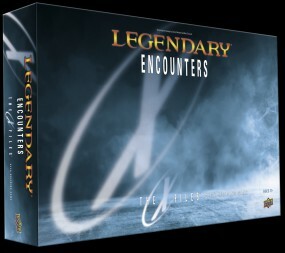 Produktinformationen "Legendary Encounters - A X-Files Deck Building Game"
In the cooperative game Legendary Encounters: The X-Files Deck Building Game, you play a team of agents — choosing from among Mulder, Scully, Skinner, Doggett, and Reyes — as you investigate the X-Files and work to unravel the greater conspiracy behind them. During the game, your team will play cards from their own decks — recruiting other agents, uncovering evidence, and fighting enemies. If you do well enough, you will face the final challenge – the conspiracy’s vicious “End Game”! During each game, you’ll play through three “seasons” of the X-Files™ show (the game covers the first nine seasons). Each player starts the game with a deck of basic cards. At the start of your turn, you’ll add a card from the Conspiracy Deck into the Shadows. It could be an Enemy, an Event, an Informant or even a Lead about the conspiracy. You’ll play cards from your hand to generate Attack, Recruit Points, and special abilities. You’ll use Attack to defeat Enemies and to reveal hidden cards in the Shadows. You’ll use Recruit Points to find and recruit new character cards in the Bureau for your deck. Whenever your deck runs out of cards, you’ll shuffle your discard pile to make a new deck, including all of the new characters you’ve recruited. This allows your deck to get stronger over time. But beware – your adversaries also get tougher as you go. Players must work together on their turns to find Leads and discover Evidence of the conspiracy’s End Game. The more Evidence you Collect, the better your chances will be when you face the End Game. If you somehow overcome the End Game, you win the game. But the conspiracy isn’t a passive participant in this game. Its End Game will have a wicked assortment of abilities and the conspiracy uses all kinds of X-Files™ to distract your team and keep the pressure on you. At the end of each turn, if there are any Enemies remaining in the Field, they will Strike you. If a player takes damage equal to or greater than their health, they’re defeated and the team loses the game -- they can’t bear the practical and emotional loss of their colleague. However, if “The End” has begun (if the End Game card has been revealed), the players will soldier on without their teammate. Once “The End” has begun, either the conspiracy will succeed, or a few brave agents just might save the world. Weiterführende Links zu "Legendary Encounters - A X-Files Deck Building Game"
Kundenbewertungen für "Legendary Encounters - A X-Files Deck Building Game"